Elder Dice have been so popular that the first printing is sold out! Fear not, however, the second printing is on its way and we will start accepting preorders for it soon. To celebrate, we are giving away the complete Elder Dice collection. Click here to enter to win. We will open preorders for the second printing of these sets soon. You will be able to get them for a reduced price and receive bonus gifts just for preordering. Sign up for your chance to win the Elder Dice collection and to know when preorders go live. 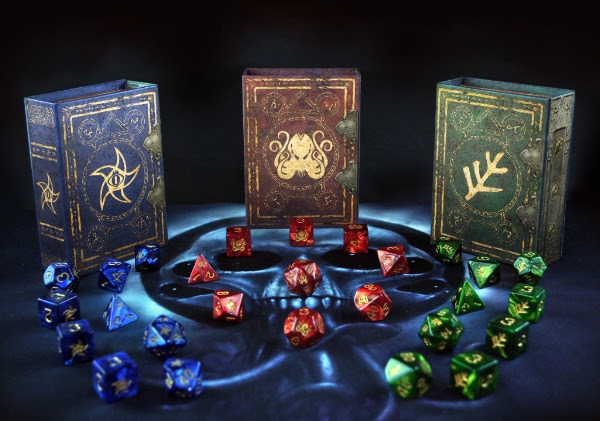 The Elder Dice collection includes one polyhedral set for each design (the Red Brand of Cthulhu, the Blue Astral Elder Sign (Star), and the Green Elder Sign (Branch). 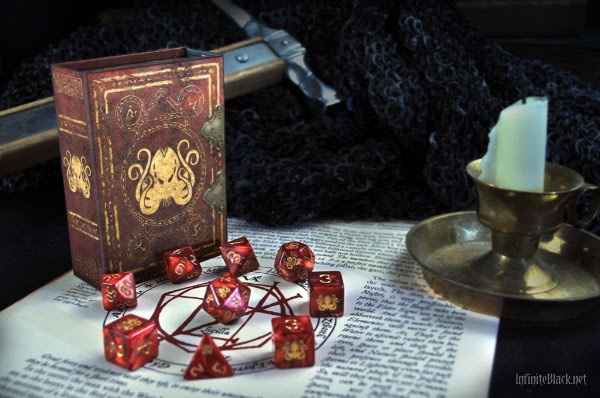 Each set includes nine dice (one d4, three d6s, one d8, one d10, one percentile die, one d12, and one d20) and includes a matching magnetic spellbook box. PLUS the winner will receive one tube of nine d6s for each design, for when you need to roll d6s by the fistful. Come by and enter the drawing today. We look forward to seeing you around the internet! Join us in the Elder Dice Facebook Group! Follow Infinite Black on Twitter, Instagram, and YouTube! Tagged Elder Dice, Infinite Black, Press Release. « PRESS RELEASE – Hero Realms Journeys – on Kickstarter NOW!